1. 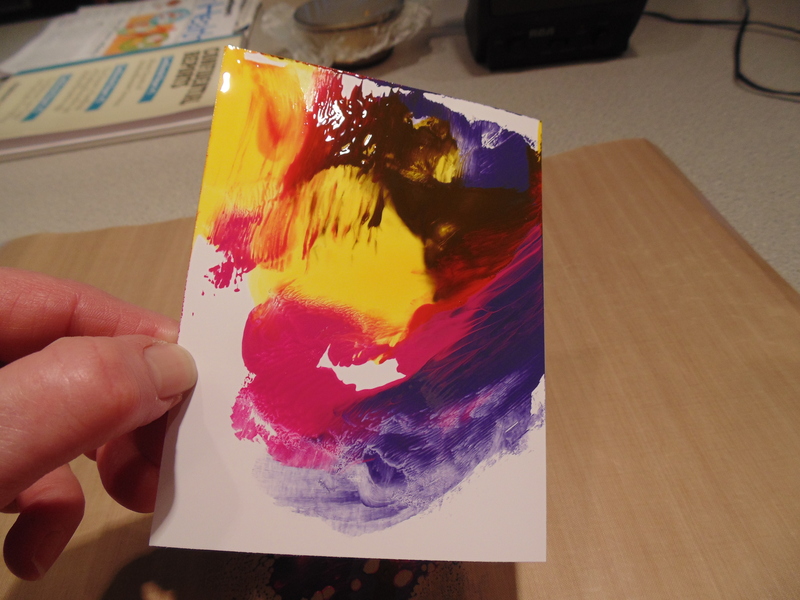 Take a piece of photo paper or glossy card stock. 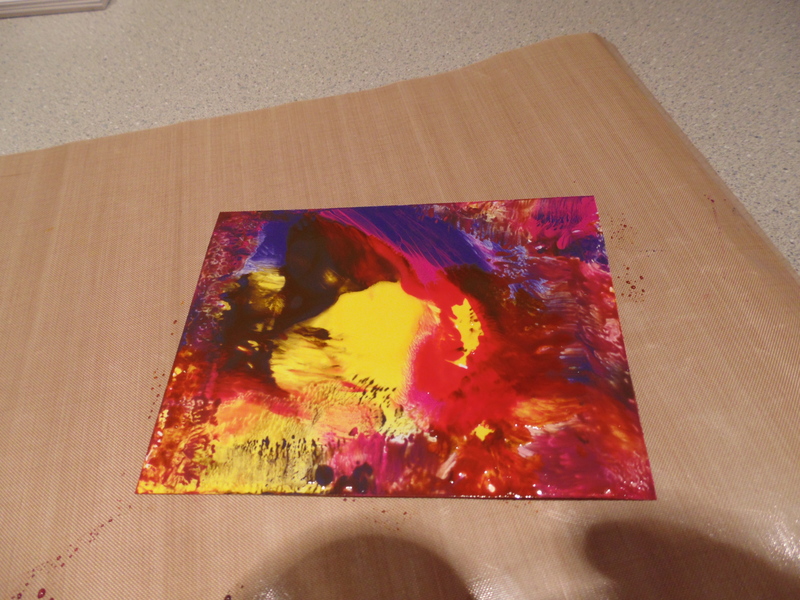 I took a piece of photo paper for mine. Lindsay W. from our group said in one of her Ask A Crafter segments that photo paper dries faster than glossy card stock. I just had my photo paper at hand so I used that. 2. 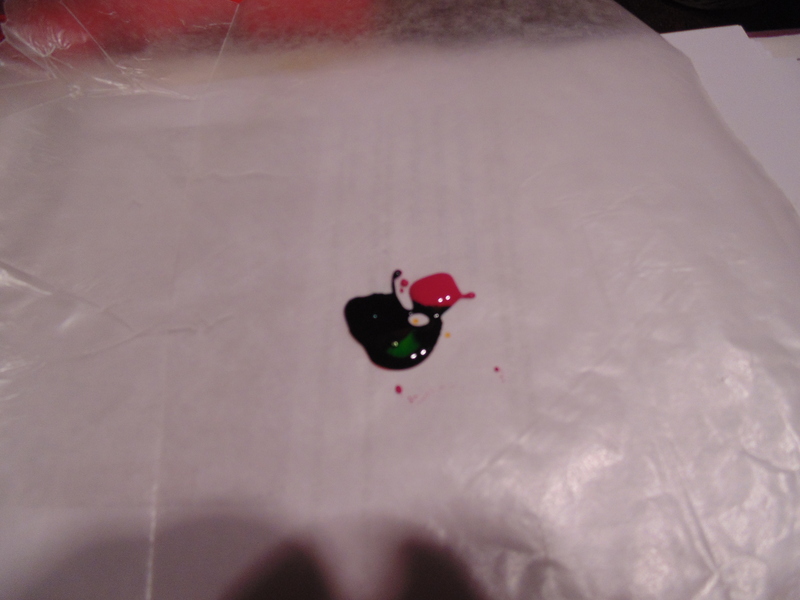 Either get out your craft sheet (if you have one) or get out a piece of wax paper. You are going to put your ink on that. For those who don’t know what a craft sheet is, it’s very similar to a Silpat (if you do any baking). It’s a silicon mat that just wipes clean with no muss, fuss, or bother. Just don’t cut on it. 3. This first example is using the craft sheet. 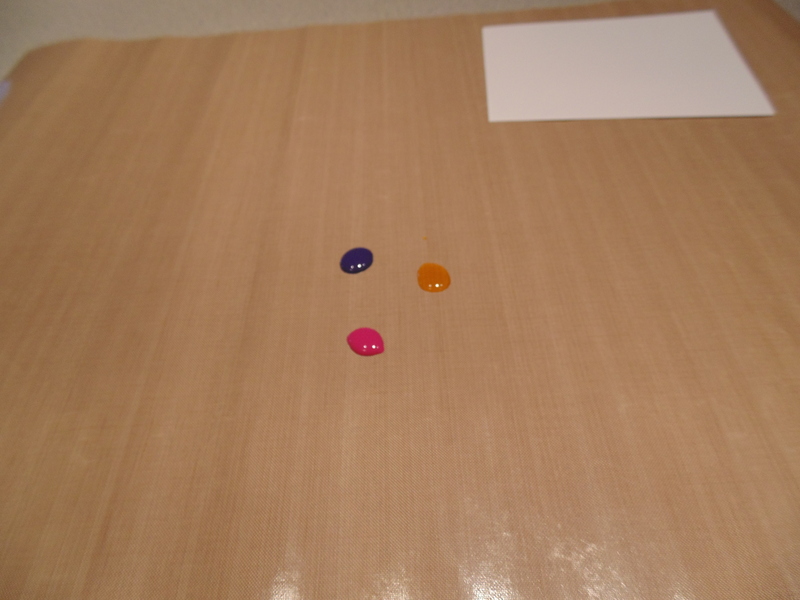 I put 1 small “blob” of pink pigment in one area, one small “blob” of yellow dye-based ink in another area and in the third area I put 1 small “blob” of lavender pigment ink. That white piece above is my photo paper. 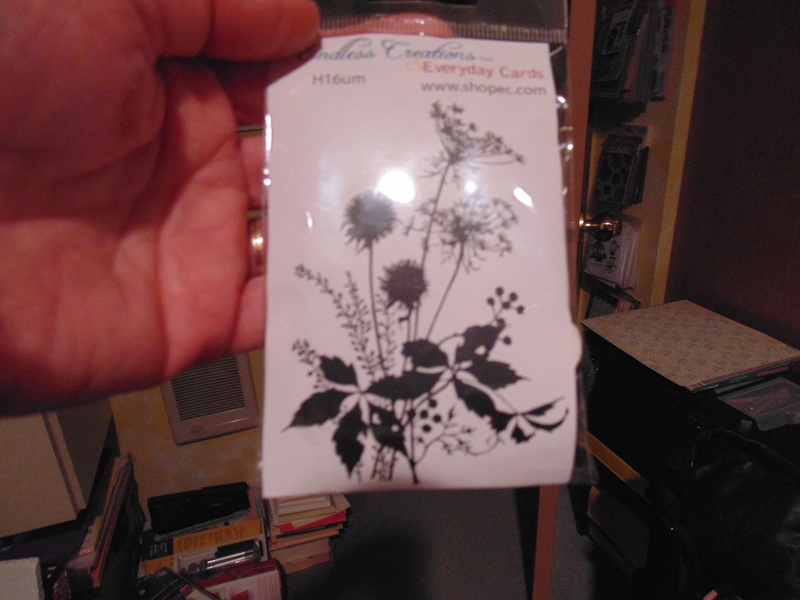 Once those dry, I’ll make cards with them to share. I wore one latex glove while working with these and found I could dab with the glove the areas that were still white to give them some color and not smear everything. It also kept my fingers clean. Can’t wait to make cards with these. Doesn’t the last one above show depth – like you are looking through a hole – maybe underwater? Can you see a Koi swimming around on the paper above? Maybe even a little vellum to see through? Lots of potential!! Let your imagination run wild and make your background with your inks. Try pigments, dyes, or a combination of both as I did. 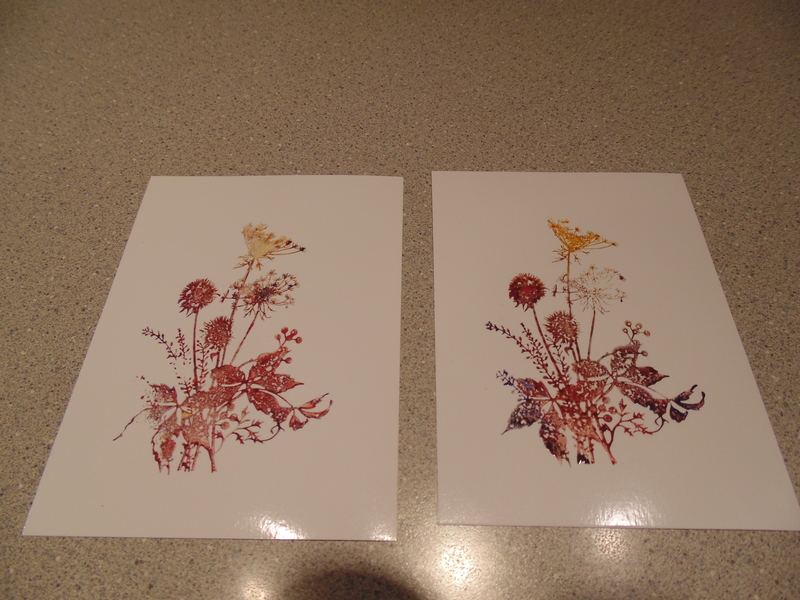 Now pigments don’t dry on the photo paper so either emboss it or heat-set it. 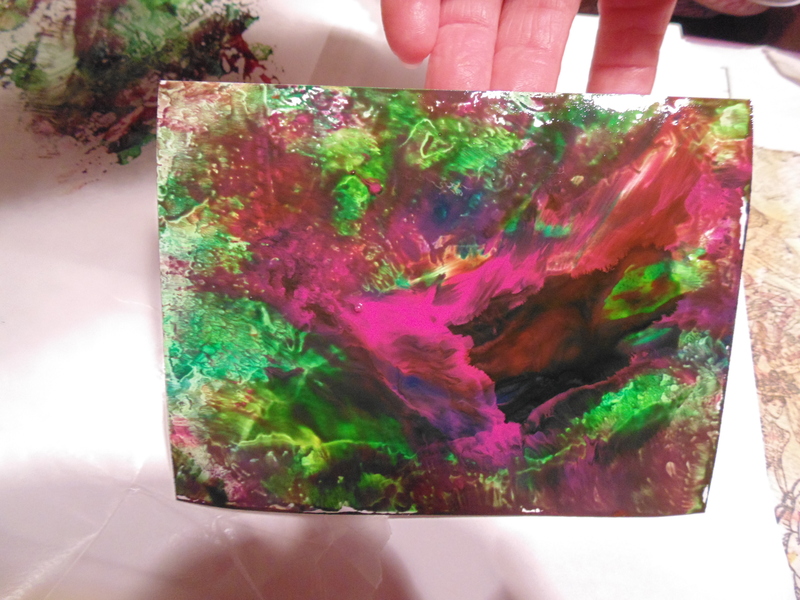 Be careful heat-setting on photo paper – heat from the bottom, then the top, and back again and don’t do too long or the paper will bubble.